My big messy project is moving along. As always there were some scary times when materials were not arriving in time but nature took care of the delays with snow and school cancellations. As pictured I’ve been using paper twine to help kids follow whatever pattern we use. In this case a spiral. I’m finding that little parts like mosaic and small handmade bits engage these autistic types. Repetition is a great learning tool. I was told I was ADHD as an adult. I have a very short attention span or hyper focus. Mosaic is the only thing I could do all day and it works for these kids too. They seem to love it. I have no idea why it works for us but don’t really care. It works and that’s enough for me and the results are cool. I am loving working at this school. It feels like home. I drive almost 2hrs to and from so this is a good thing. Mosaic Art Supply pulled through getting us tile in time…we are using glass tile and applying them and the handmade bits to mesh to set on plywood with thinset later. this is a great way to have kids explore the medium and than cut and paste to make it work on the final piece. Handmade cutouts with mosaic look ok no matter what happens and that’s why I love it for my big messy projects. I like to add unique big objects designed by kids or staff… in this one the art teacher Barbara drew a sketch of her cat to use. A student drew another teachers dog that morphed into a 3D version to mosaic. One student drew an F16 to add in the sky. All good by me. I find it’s good to mix a few whites together for a thing than just one color. the cat is a combination of 3 whites and the background is a combination of 4 blues. the tiles are attached to the cat form with Elmers. I prefer tacky glue or Weldbond but they didn’t come in time. Any PVA glue will work. If it gets messy they are water soluble and scrub off of cement products in the end. Interior projects have more wiggle room. If the tiles are set too close it isn’t a big deal since you aren’t dealing with water penetration and frost. We have a kiln!!!! even if kids mush up the colors they work out. We used cookie cutters to make tiles for kids to underglaze. I have been using Amaco Velvets. It seems like even if kids mush up the colors it works out. Those that could make more unique parts did but every kid had a good time. The school had dried up white clay that we rehydrated and hand wedged and rolled with a rolling pin. We then put a gloss glaze on top so everything turned pink. I never get bored seeing things come out shiny from the kiln after the glaze firing. Since starting to draw this way awhile back I’m getting better and learning so many new things. I’m finding it addictive to draw like this. I started with the Adobe Draw app. I really enjoyed drawing in this app but it kept crashing so I looked for something else. Part of my problem with the app was a stylus. Once you start drawing more you find your finger just isn’t as precise. Then it’s off to learn about stylus. The types and choices can be daunting. I bought a box of 10 for under 5 bucks and quickly switched to a box of 2 for 14 bucks. The box of 2 has a clear disk on the tip( like an Adonit Jot) so you can see where your lines start. It has a fiber like tip on the other end that works like the cheaper stylus and it came with extra tips. Then I found a discounted Adonit Touch so I bought that to try. It is pretty great and lets you draw with pressure sensitivity so the line width changes like a real world fountain pen. It crashed Adobe Draw alot though. So I switched to the Concepts app. Concepts is more complex and a cross between a drawing app and a CAD app. I’ve been using the Ipad app Archisketch for simple CAD drawings that need scale and measurements. Now I start there and then color them in Concepts. Mostly I’m playing. 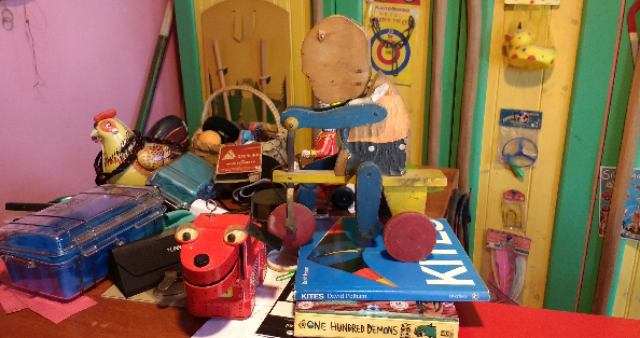 I’ve been drawing my tin toys. In Concepts I only had to draw one gator and then duplicate,rotate ,and scale. You can drag and drop from anything on your Ipad which is really amazing….even from the web This one of tin fish I will probably change. Layers are so liberating. I can delete the water bit and try something else without starting all over again because the parts are drawn on different layers. Both programs are great fun to learn. Concepts does more so a steeper learning curve. It is worth learning though. I am having so much fun learning this stuff. Abdulla drew an amazing image of Gail’s dog. So much changes in the translation to 3D. I did my best to get the spirit of it. It will continue to change. These group projects are like whisper down the lane and what you start with transforms along the way as you add new techniques and materials. In the end it seems everyone involved feels a sense of ownership. I love this. Personally, I made some great discoveries about foam cutting tools this week. I will never use a corrugated shaper again because they make a fine mess that sticks to you and everything else by static electricity. A “knife” of all sorts is the way to go. I found some info online about using a sharpened drywall knife to cut foam and it is great. The trades are an excellent source of information to tweak to art. I bought knife blades for my portable jigsaw..also great. I then tried a knife blade on my Fein multitool and wow…amazing too. No more little bits to clean up! this is such a BIG improvement for me not only because power tools make things easier but doing hand cutting works better too. I now have shavings to collect and they don’t respond to static electricity the same way. We started making clay bits last week but I am having too much fun to photograph it…hopefully next week I will take some pics. The students are doing so well…I only wish I knew what was going on in their heads. We are covering the forms with paper now. These students are doing so well that they complete whatever I bring in for the day. This is another messy job but we have a big tarp under the work table to contain the mess. This time I am using unyru paper rolls and diluted elmers glue. I love this paper but it has gotten too expensive to use in my future school projects. I will switch to bogus paper available at places that sell packaging material. It is recycled newsprint and kraft paper but slightly heavier. You need a paper that is unsized so it is more malleable. Sized papers are stiff. Unsized papers eventually become pulp. Unryu is very strong,stays workable for a long time and covers in one or two layers. Bogus paper usually requires more layers and isn’t as malleable but it works well enough and it’s cheap. My personal favorite is blotter paper. It is thick and covers in one layer but turns to pulp fast so hard to use with kids. Last year I used what I called art snot as an adhesive with what I called bogie paper. Great art terms for 2nd graders. It is methyl cellulose and I used Elmers art paste. I had trouble with the layers de-laminating and haven’t tested it again so I went with white glue which I know works. The paper needs to form a hard stable surface over the foam.